Could you be a Belper chaplain? All are welcome at the next Belper Chaplaincy meeting on Tuesday October 20th at New Life Christian Centre, High Street. Workplace Chaplaincy in Derbyshire is growing… and of course, this includes Belper! At least 65 people from churches all over Derbyshire attended recent Workplace Chaplaincy training at Willersley Castle. It was introduced by the Revd Paul Morris, Principal Chaplain at Derby City Centre Chaplaincy, based at St Peter’s Church in Derby. Author Paul LinfordPosted on September 11, 2015 January 25, 2019 Categories ChaplaincyLeave a comment on Could you be a Belper chaplain? 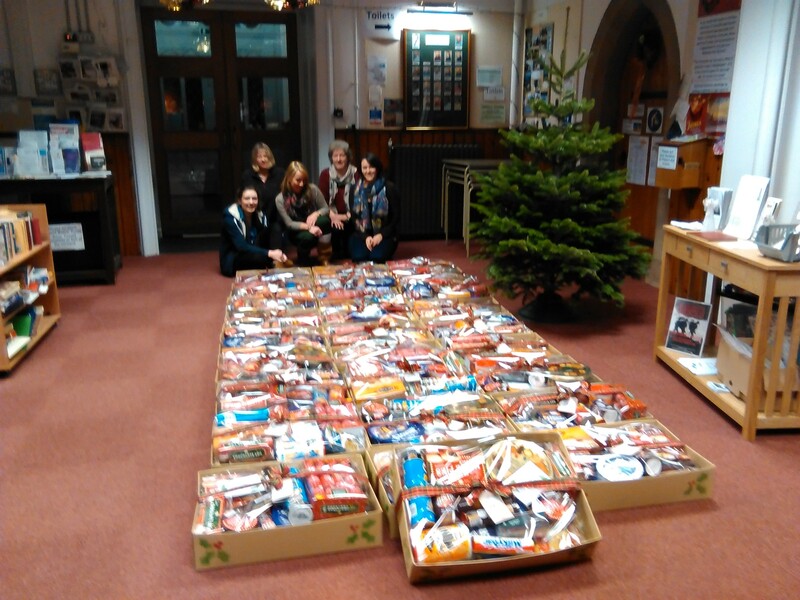 Once again this Christmas, Hope for Belper gathered people from across the town to provide Christmas hampers. The Sure Start Children’s Centre and the Multi Agency Team were pleased to be able to support families in this way again this year. Once again there was overwhelming support from the local churches and individuals that raised close to £2000. This meant we could pack the twenty eight hampers that were required with a little extra in each one thanks to the amount of money donated. This year Hope for Belper also teamed up with Christians Against Poverty (CAP) who raised £480 for the eleven hampers going to families that they support and work alongside. A huge thank you to all those who supported this project by donating time, money and various others gifts and to ‘Inspirepac’ who donated the boxes and enabled Hope for Belper and Christians Against Poverty to deliver thirty nine hampers this Christmas. The winter beer and food festival was a fantastic success again this year, riding high no-doubt on the news that Belper had become the overall winner of the Great British High Street 2014. One of the things that marks out these type of events is the great sense of the community enjoying rubbing shoulders with itself and others visiting from further afield. The churches provide a small but significant facility on this particular occasion each year. The Town Council provides a couple of gazebos for us to shelter from the cold breeze, enabling tired children to enjoy free Christmas based crafts. Everything from shepherd masks to 3D Christmas trees are made and brightly decorated, whilst parents get to stand and chat or have a go themselves! 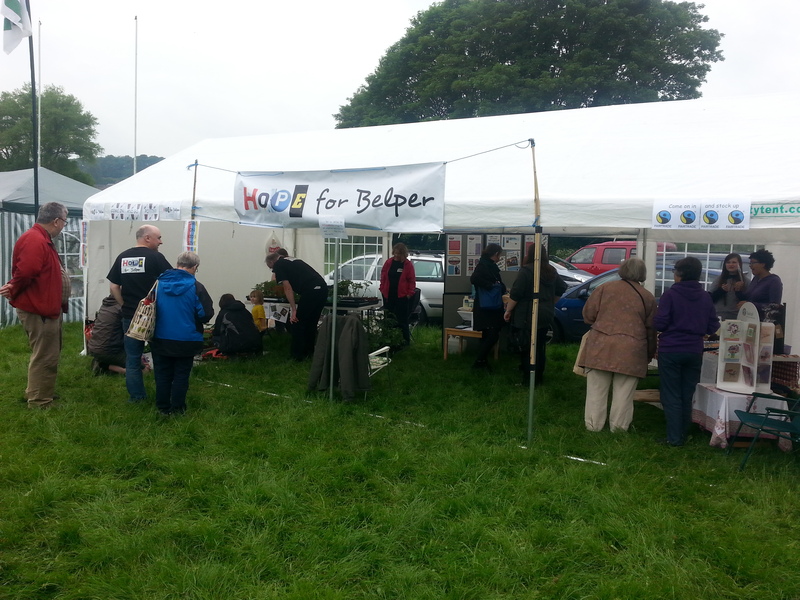 It is always very enjoyable to take part on the Hope for Belper team for this event, so as we approach next year’s festival do think about a stint on the H4B stand yourself – no special skills required just a friendly and encouraging face. Author Paul LinfordPosted on January 13, 2015 January 26, 2019 Categories Local festivalsLeave a comment on Free Festive Fun! The second Belper Goes Green Eco Festival hit town at the end of May just as the weather turned from very wet to beautifully sunny! The greener fingered among the church congregations had spent the previous few weeks nurturing tomato seedlings among other things ready for the festival weekend. The Hope marquee housed a temporary nursery, encouraging youngsters to get enthusiastic about growing things. Over the Saturday of the festival weekend around 150 children dragged willing (to varying degrees) parents in to our tent and got their hands in to some lovely compost, repotting the seedlings in to larger plant pots and taking them away in the hope of juicy tomatoes to come. We also had an excellent array of fair trade products for sale and a display about what goes in to one of ‘The Basic Idea’ food parcels. Particular mention should go to Gareth Stoddart for rescuing us with the erection and dismantling of the Hope marquee – one of these days we’ll actually make sense of the labelling. Thank you also to all those who helped out on the day (in particular our very own Percy Thrower in Kate Greenwood), but also to all who had a go at the growing. Last month saw Belper churches hire the Ritz Cinema for a special matinee performance of ‘Despicable Me 2’. Arrangements were made and tickets went out to the Children’s Centres and Primary schools. Over 80 children, parents and grandparents came on the day and for some it was their first time at the Ritz. Dozens of cakes and cookies were baked and every last one eaten up by some very excited cinema goers! There are times when day to day life stretches all of us and illness, financial concerns and emotional upset can get the better of us – so it was a great delight to once again be able to extend a very simple hand of unconditional love through this project. We hope that everyone who got tickets enjoyed the afternoon and thank you to all who contributed in organising and running the afternoon. Author Paul LinfordPosted on July 11, 2014 January 26, 2019 Categories Cinema showsLeave a comment on Show Time!